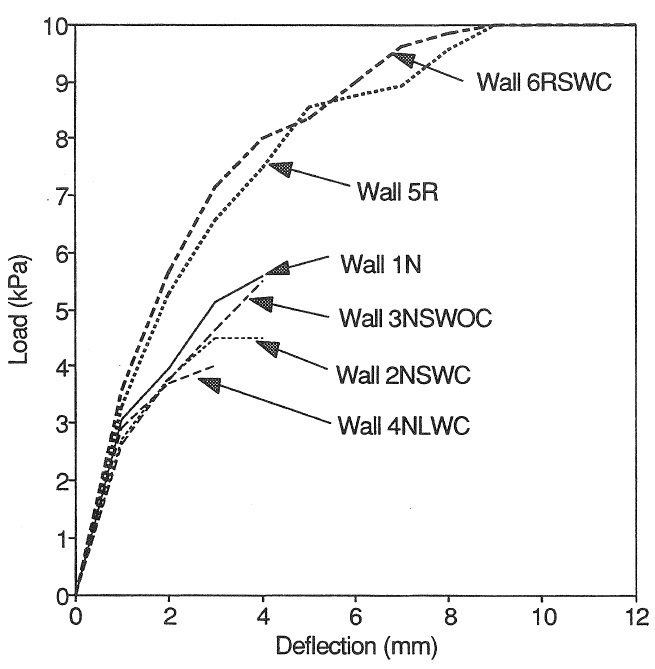 The test results for six full-scale concrete block walls subjected to uniformly distributed out-of-plane loading are reported. The walls had overall dimensions of 2.8×6.0 m. The effects of size and location of openings and of steel reinforcing were investigated. All walls were simply supported on all four sides with clear span dimensions of 2.8×5.8m. Auxiliary tests were performed on masonry assemblages to obtain the basic material strength characteristics. These included tests of individual joints under bending normal and parallel to the bed joint to document the respective flexural tensile strengths. The first cracking loads and the failure loads were determined as well as the load deflection behaviour over the full loading range. The impact of openings was relatively small and reinforcing resulted in substantial increases in failure loads. The results from yield-line analyses were compared to the failure loads and gave conservative prediction of capacities.